"The Boy Who Wouldn't Grow Up"
Peter Pan, the immortal classic by J. M. Barrie and adapted for the stage by Milo Mowery, Rodolfo Ortega and Jeff Sanders is playing at the NW Cultural Center through January 6th, 2013. It is located at 1819 NW Everett St. The production is directed and choreographed by Sarah Jane Hardy (NWCT’s Artistic Director) with fight choreographed by Zero Feeney. Flying By Foy has been doing this since the Mary Martin version in the early 50’s. For further information go to www.nwcts.org or call 503-222-4130. Productions of this play go back to the early 1900’s. And the part of Peter has usually been played by a young woman. It has been on stage and TV as a musical with Mary Martin; a Disney, animated version (voiced, this time, by a boy, child actor Bobby Driscoll); Mia Farrow in a later TV incarnation; Spielberg’s opus, Hook, with Robin Williams; a 5-act, British, Trevor Nunn stage interpretation; and, more recently, a very good, non-musical, Australian film, with a boy as Peter; et. al. Reading into the story, it is clear that Barrie is very respectful of women (Mothers, in particular). As Peter explains, the reason there are no girls as Lost Children in Neverland is because they are too smart to fall out their prams (and, thus, hustled off as a lost child). He also has a dim view of Men, as they are pictured either as a Prig (aka, Mr. Darling) or a cut-throat Pirate. And Neverland is an escaped from the horrors of Adulthood. A chance to preserve forever the innocence of Childhood. Alas, tis not to be—reality will win out. This production is a premiere of another musical re-imaging of the tale. Gone are Tiger Lily and her tribe (probably, politically incorrect, nowadays) and also the bittersweet epilogue where Peter meets Wendy’s daughter, Jane, unaware of the ravages of time. And also gone are the endearing songs from the original musical and replaced with a new look into the unending magic. Some are successful, some are not. The story should be familiar. Peter Pan (Michael Kepler Meo), a perpetual boy, is entranced by bedtime stories that the oldest daughter of the Darling family, Wendy (Lea Zawada), tells to her brothers. So he entices her and her brood to fly with him to “…the second star to the right and straight on till morning,” so that she can be a Mother to his pack of Lost Boys. Needless to say, a band of Pirates, under the leadership of Captain Hook (John Ellingson) are constantly at war with Peter and his group. Of course, like all good fairy tales, this one ends up with everyone getting their just deserves. The flying is super and set changes equally impressive, in how quick and smooth they are. The sword-fighting scenes by Mr. Feeney were quite entrancing without appearing dangerous. And the scenic designs and miking (Jeff Seats, Shana Targosz, & Kristeen Willis Crosser) were wonderful, especially the creation of the dog, bird and crocodile. The flow of the show must have been a nightmare to coordinate but under Ms. Hardy’s capable hands, it all comes off seamlessly. As mentioned, some of the songs work and some don’t. The best of them are I’ll Not Leave You; Boys Are Mean to Birds; I’ll Never Grow Up; and The Boy Who Lives Forever. Much of the success of these numbers is because of the almost operatic voices of Mr. Meo (Peter), Ms. Zawada (Wendy), and Sophie Shely as the Neverbird. They have a solid future in singing and musical roles if they choose to pursue it. The Hook (Mr. Ellingson) and Smee (Kevin-Michael Moore) team, the villains you love to hate, are quite effective in their exchanges with each other and, especially, with the audience (to cover the scene changes). Mr. Meo as Peter is quite extraordinary, both in voice and as an actor. I predict an exciting career in this field for him. And Ms. Zawada as Wendy is equally impressive, both in singing and acting. I have marveled at her before in OCT productions, as well as their Y/P improv troupe, Impulse, and as Rose Red in NWCT’s Snow White. I look forward to seeing her fine performances in future productions. And to emphasis that a role being small doesn’t mean you can’t shine. Cases in point, Ms. Shely in the demanding roles as Nana, the dog, the Neverbird and Tick-Tock, the Crock are excellent. She manages to convey in her movement and singing the character of these varied creatures, as well as manipulating the puppets. Well done, Ms. Shely. And Parker LaRiviere as Slightly, one of the Lost Boys, is noticeable in his command of the stage when he’s on. I expect good things of him, too, in the future. This is a production to be seen, as the acting is outstanding and the story a recognizable classic. A warning, though, get there early, as parking is a real problem in the NW area of Portland. And if you do choose to see this warm play over the Christmas Season, tell them Dennis sent you. "Lest We Forget . . . "
This production will be presented through December 16th. The school/theatre is located at 1939 NE Sandy Blvd. It is directed by Dani Baldwin (OCT’s Education Director) and written by Pat Kruis Tellinghusen. Musical Director is Jeffery Childs. For more information on the classes/season/production, contact their website at www.octc.org or call 503-228-9571. This show was originally presented by the Tapestry Theatre in Portland a number of years ago. I saw it at the Old Church. It was a part of a Christmas From Home series by a local writer. It justifiably honors our veterans who are fighting on the battlefields in far-off countries. The play includes a true incident of a Christmas Truce that happened on the warring grounds in France during WWII. Opposing sides simply put down their arms, exchanged gifts, sang Christmas Carols and buried their dead in peace. Could not that sentiment be carried through on a global scale? Only missing one ingredient. Tolerance. 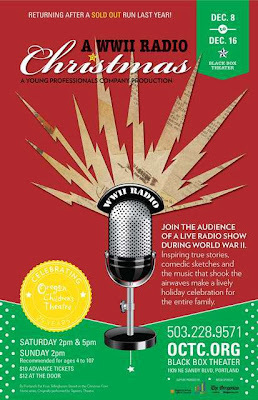 The story concerns a radio station in 1944 doing a show for the soldiers, fighting overseas, and the loved ones left behind. They sing familiar songs from that era, including Mr. In-between; Shoo, Shoo, Shoo, Baby; White Christmas; I’ll Be Seeing You; Have Yourself a Merry Little Christmas; and I Heard the Bells on Christmas Day (from a poem by Longfellow). It also includes PSA announcements and commercials from that time, skits, and letters to and from home. The show is only an hour long but it packs a wallop in those brief minutes and covers a lot of territory. There are touching moments, such as the story of the Christmas Truce; returned letters, probably meaning a death of a soldier; and romances found, and lost. There are moments of humor, such as the commercials, and those terrific songs, well-rendered by a very talented cast. And a special nod to the Foley effects (“performed” by the cast), creating the sounds for the radio, adding immensely to the authenticity of the production. The entire cast is exceptional and a fine example of an ensemble. Each of them play many characters within a short period of time, complete with dialects, different ages, and individual gestures and mannerisms. They all deserve to be mentioned, as there is not a weak link in the bunch: Collin Carver, Madeleine Delaplane, Bryce Earhart, Jeremy Howard, Daniel Martin, Annie Parham, Jessica Skinner, and Celeste Spangler. Many of the cast are alumni from the sold-out production of this show last year. They are all students in their teens at OCT’s school. Some have performed in other productions of Y/P, such as Dracula and/or the improve troupe, Impulse, as well as Main stage productions for OCT and other theatres. Mr. Carver has the look and sound of a young John Cleese, especially in the opening monologue to the audience. And Ms. Delaplane even had a featured role in a locally-made, full-length, Indie film (imdb.com under Nightbumpers). But I applaud them all as probably the Best (yes, that would include the Equity companies, too) Ensemble show I’ve reviewed to date! But one has to ask, how the heck can these young people identify with characters of their grand-parent ages?! Individual soul-searching, I’m sure. But to expose those attributes take the two T’s—talent and training. The talent (not skill or craft, which can be taught), I believe, is God-given. The training is from a coach/instructor/director that has the ability to extract that talent from them and nudge it to embody a character/role, no matter what age, nationality or era the story takes place. Proof of this can be seen now in this production, as products of their education at OCT! The direction by Ms. Baldwin is first-rate. Every nuance of these characters is carefully constructed and directed. And being the head of the school and director of some of the main stage plays (and a pretty fine performer in her own right) she would have the added knowledge of knowing the strengths of her students. Mr. Childs, and especially, Eric Nordin, as the Pianist, added greatly to the success of the music numbers of this show. One suggestion would be to add pics of the cast, so that in such a multi-character show, one could identify who is who. Also listing the songs would be an advantage, too. I would highly praise the company and the school for producing such fine talent. It’s highly recommended by me but I would hurry to get tickets, as they will surely sell out. If you go, tell them Dennis sent you. 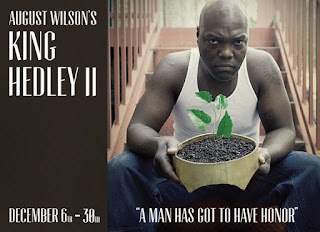 This play is written by August Wilson and directed by Jade King Carroll. It runs through December 30th. The theatre is located 602 NE Prescott St. in North Portland. 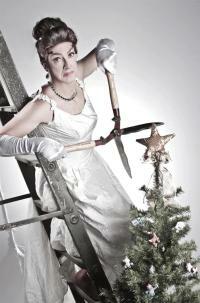 For ticket and season information call 503-488-5822 or visit them at www.portlandplayhouse.org. 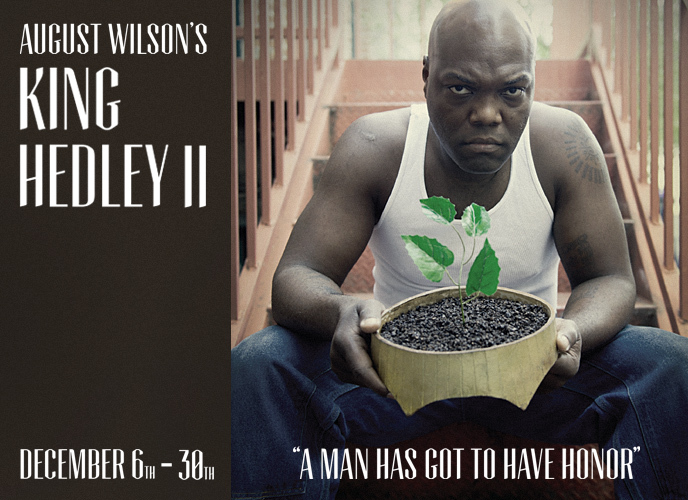 At the center of the story is King Hedley II (OSF actor, Peter Macon), a ticking time bomb, dissatisfied with his lot in life. He is looking, if not for easy money, at least a fair shake, unhampered by race issues. He has a willing accomplice and supporter of anything he does from Mister (Vin Shambry, son of Red from Seven Guitars). Meanwhile his wife, Tonya (Ramona Lisa Alexander—from Seven Guitars) has a job and wants a family and a “normal” way of life. They are living with the woman who raised Hedley, Ruby (Monica Parks), who has her own desires and secrets. Next door lives Stool Pigeon (Victor Mack, playing an older version of the same character he was in Seven Guitars). He spouts Bible quotes, collects newspapers for his view of the world and, with all his eccentricities, may be the most aware person of them all. Into this explosive mix arrives Elmore (John Cothran, Jr.), a con man and an old flame of Rudy’s. His intrusion into their precarious lives, upsets the delicate balance and sets off a chain of events that will, ultimately, end in tragedy. To tell more of the story would expose parts of it best left to the discovery of the audience. The direction by Ms. Carroll keeps the energy and flow of the story moving at a brisk space, although three hours long, it is never boring. Her connection with the actors in the show is obvious, as every look and nuance of theirs has meaning. And the Scenic Design by Owen Walz is terrific. You literally feel you have been transported in time and space to the poorer section of a large city in the 80’s. The whole cast is electric! I couldn’t imagine anyone else playing those roles. They actually inhabit them, as any trained professional actor would. Mr. Macon, as Hedley, is a powerhouse, a force of Nature to be reckoned with, driving his character and the story to its inevitable conclusion. Mr. Mack is fascinating to watch, as his character tries to balance Bible teachings with the harsh realities of the “real” world, a continuation of his character, Canewell, in Seven Guitars. Mr. Cothran, Jr. is a master. His monologues set up much of the history of the story and one is rapt when he waxes eloquent on them. And Ms. Parks does equally well with her reminisces of a world gone by and a life never realized. Mr. Shambry and Ms. Alexander round out this powerful cast, filling in solid support for the sad but powerful structure of this tale. But it’s also about Birth, Death, and Re-birth. As proof, the seeds that Hedley plants to grow flowers; the kitten that is buried in the garden, with the understanding that it will be re-born; the death of one of the characters in the story, with a baby on the way to fill this void; and Bible quotes throughout to the Cycle’s continuation. (Similar instances are in Seven Guitars.) The world may be “too much with us,” but with us, it is, like it or not, for better or worse. Interesting to note that Wilson’s Two Trains Running will be playing at OSF this Spring. The third of his plays performed in Oregon within a year. Good to hear, as it’s well deserved. If you choose to see this play, tell them Dennis sent you. 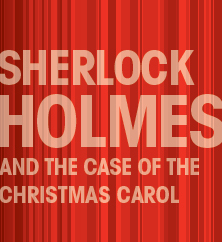 "Dole/Dickens - An Uneasy Alliance"
Sherlock Holmes… plays at ART through December 30th. It is written by John Longenbaugh and directed by Jon Kretzu. ART is located at SW Alder & 16th Ave. Contact them at www.artistsrep.org or call 503-241-1278 for ticket/season information. This is the second time (first, being Triangle Productions) this weekend I’ve reviewed a show with a terrific cast being hampered by a flawed script. The intent of the play is to join Dickens’s Scrooge with Doyle’s Holmes. As far as the script goes, this union is forced, at best. But a wonderful cast manages to pull Christmas magic from a shaky premise. As the story begins, Mr. Holmes (Michael Mendelson) coldly ignores and shuns his closest companions, Dr. Watson (Tim Blough) and Mrs. Hudson (Jane Fellows). With that accomplished, he sits alone on Christmas Eve to contemplate his barren existence. Thus arrives Moriarty (Tobias Anderson) from the grave. As penance for all his evil doings, he forewarns Sherlock of visits he will have of three spirits, sent to alter his behavior. The first spirit (Nathan Crosby) illuminates a lonely youth (Matthew Kerrigan) of Holmes, where he alienates himself from his family and his true love, Becky (Melissa Whitney). The second spirit (Gary R. Powell) exposes the present day, in which he is a silent witness to those around him, as to how much he really is loved and needed. The third spirit propels him to a future in which the world is ravaged by war and destruction, and he will become a Moriarty-like contributor. I think we all know the outcome. Holmes sees the errors of his ways and becomes a changed man. He is redeemed. 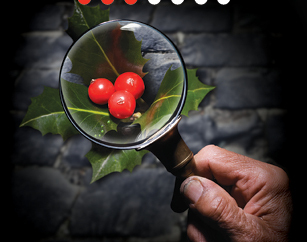 He embraces his friends and Christmas and even solves a mystery in the bargain. Such is the Beauty of this Season! The entire cast (as mentioned) is wonderful. Most of them play numerous roles and do them all very well. They are all articulate and precise in their speech, lending well to the diverse portrayals of each of their characters. Outstanding among the supporting players are Mr. Anderson (Moriarty, et. al. ), a veteran of many years in Portland theatre. He shines in every role he plays. Next he will be seen in a one-man show, The Illustrated Bradbury, based on stories by one of my favorite authors, Ray Bradbury. It will be produced by Theatre/Theater in the Spring. Also Gary R. Powell (Spirit 2, et. al. ), another long-time Portland veteran is a joy to watch in the many incarnations he creates on the stage. (I had the pleasure of acting with him many moons ago in The Firebugs.) A true professional. And Mr. Blough gives a heart-felt performance as Watson. You see the complexity of his emotions toward his friend, Holmes, and the hurt he must feel when pushed away. And the acting of Holmes by Mr. Mendelson (another local veteran) is spot on. He has the right look and feel (script notwithstanding) of the character. His range of emotions of this (uneasy) marriage of Ebenezer and Sherlock seems quite genuine. This character dominates the story and the actor must likewise do so with the role, as he does. The scenic design by Jeff Seats is pliable and works well in the many settings that are called for in the story. Likewise, the direction by Mr. Kretzu keeps the action flowing, in and out of the different scenes, with nary a misstep as to where they are, sometimes with only minimal settings as a suggestion. The costumes, on the other hand, don’t always succeed. The flimsy “mask” of the first spirit is an amateurish attempt at anonymity. The costume of Spirit 2 is silly, at best, looking like a giant leprechaun. Spirit 3 fits the setting of the future (as written), being an industrial black smoke stack, but it comes across more of a toy than anything scary, albeit the mechanics of it, (the same, I assume, as the boat in their Jack Goes Boating) is quite effective. This, of course, could all be called for in the script and, if so, is not the fault of the Costume Designer (Jessica Bobillot). The rest of the costumes are quite compelling. The fault, then, “lies not in our ‘stars,’” but in the material. The attempt of meshing two famous, legendary, fictional characters into one story is dangerous from the outset. You must, at least, have two compatible genres and, in this case, you don’t. Yes, they are both written by British authors about loners “living” at approximately the same time (late 1800’s). But that is where the resemblance ends. And his childhood doesn’t really seem so bleak (except for his mother dying) as his brother, Mycroft, seems very supportive and he obviously has the love of Becky. But, again,for no discernible reason, he spurns both of these gestures of warmth. The second act works the best, seeing the importance of his influence on people and situations. But the third act seems more of an indictment on War rather than having anything to do with the immediate story. (Interesting note, there was a television presentation by Hallmark, I believe, in the 60’s called Carol For Another Christmas, which had a similar theme, but the formula was used throughout the tale.) In short, the joining of various themes/genres in this play, doesn’t often work. Does this mean the show is not worth seeing? Absolutely not. The cast is excellent and should be applauded. And is it not the holiday season wherein feelings of joy and good fellowship should rein? You bet. And this production, by the end, does leave you with that. A side note, one of ART’s Season Sponsors, the Hotel Deluxe (only a block away), has an excellent Happy Hour menu and a terrific brunch. I highly recommend it. And if you do go to one, or both of these venues, tell them Dennis sent you. ". . . a bumpy night"
This show runs through December 23rd. It was written by Jeff Church and Ron Megee. The show is directed by Angela McKennie and produced and designed by Don Horn (co-founder of the company). The theatre is located at 18th & Sandy. Go to www.tripro.org for production information and/or call 503-239-5919 for tickets. This event takes place in the being of the film diva and icon, Joan Crawford (Kam Sisco), later in life. It happens during a very low spot in her career, before Trog but after Johnny Guitar. Other low points for her during this era were The Caretakers and a Serling Night Gallery segment. She had become a parody of herself. And “therein lies the rub.” Can one write a parody of a parodoy? The entire action of the play takes place in the semblance of Ms. Crawford’s apartment. It is the night of a Christmas party she is giving. She runs rough-shod over her two servants, Mamacita (Sarah Dresser) and Carl (James Sharinghousen). It soon becomes obvious there is no love lost between them. Her affections go entirely (except for her dog, Princess, played by Francesca Heine) toward herself and her own comfort. She talks freely about her life for the “camera,” while her underlings wait on her hand and foot. She indulges in Pepsi & vodka, her little Morkie, mayo-mask facial treatments, and revels in telling stories about her hated rival, Bette Davis. What she hates is anybody that doesn’t treat her like the star she thinks she is and, oh yes, wire coat hangers (and “therein lies a tale”). The design, direction and, especially the acting, are first-rate. Mr. Sisco as Crawford is outrageous (that’s a good thing in this case). My compliments to whoever did the make-up, as it seems frighteningly exact at times. And any man that can walk in high heels gets my admiration. His impersonation is spot on. Mr. Sharinghousen as the belittled and berated Carl is wonderful. The highlights of his performance were his rendition of the early Judy Garland song, Dear Mr. Gable and his hilarious portrayal of Trog. Earlier he had directed Dracula at OTC and performed in Avenue Q at Triangle, both fine efforts, too. Ms. Dresser as Mamacita, the German maid and, especially, Ms. Davis, in dream-like scenes from Whatever Happened To Baby Jane? is also a delight. Her Bette Davis impression is equally as good as Mr. Sisco’s Crawford. The lighting, by Jeff Woods and set design, by Mr. Horn, were also impressive, as was the choice of music and, as mentioned, the make-up. And Ms. McKennie’s direction of this eccentric production is right up her alley, having fostered other productions of Gillian: The Musical! and it’s sequel, as well as having performed the title character in Auntie Mame. I’m sure the cast owes much to her inspirations. So why the “bumpy night” title for this review? It’s the script that doesn’t fully work. It seems divided into three parts. The first part (mediocre) seems to be just a mish-mash of one-liners. The middle part (rather good) is a take-off on “…Baby Jane.” And the final section (a terrific twist—no, I won’t be a spoiler and give away the surprise ending) is excellent. So does the end justify the means? Sort of. Do the mixed genres (comedy, parody, fantasy, drama, et. al.) mesh together? Not really. Crawford became a parody unto herself in later years. So writing a parody of a character that is already a parody doesn’t work. It’s like trying to drive in a tack with a sledgehammer. This is not to say it’s not worth seeing. It is. But the actors, as good as they are, are working mightily to overcome a flawed script. You should see it and make up your own mind. If you do, please tell them Dennis sent you.